A HUGE thank you to everyone who made the 2016 Moms’ Run + Family Fun Day such a success. We raised more than $27,000 at this year’s event and topped out at almost 500 registered participants. Be sure to check out the photos from the run on our Facebook page (thank you, Jerry Coli from Main St Rock Magazine for capturing the days festivities). The race results are posted online. We also wanted to thank all of our participants that provided race feedback through our online survey. We heard great things from you all and are excited that everyone enjoyed the event again this year. The one area that we got the most feedback from as an area to improve was our race course. We anticipated this feedback this year and hoped that the extra entertainment on the course would help make for an exciting course. We do see that this is an area that will still need improvement for next year. Due to certain restrictions and at the request of the city, we are unable to route our race through the beautiful Daniel Island neighborhoods as we have in years past. We understand that this is the most desired route, and we miss it just as much as all of you! Since this aspect of the race is out of our control, we will work to make some small course adjustments and amp up entertainment on the route to make your race experience an enjoyable one. And with that, we are already gearing up for our 2017 event! If you’re interested in being on the planning committee, sponsoring the Moms’ Run or participating as a vendor, please email us at momsrun@ppdsupport.org. Thank you for all of your support and thank you for helping mother's and their families in the Lowcountry! On Mother’s Day weekend, honor moms everywhere by supporting a cause that helps women and their families suffering from postpartum mood disorders. 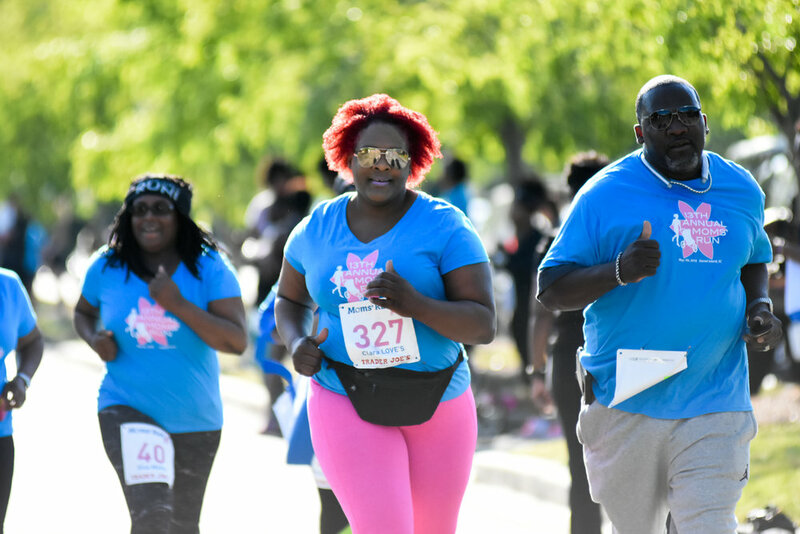 Postpartum Support Charleston is hosting the 12th annual Moms’ Run + Family Fun Day at 8:30 a.m. Saturday, May 9 at Blackbaud Stadium on Daniel Island. Runners and walkers can join the 5K run/walk starting at Blackbaud and winding through Daniel Island before ending back at the stadium for Family Fun Day. In 2014, more than 400 people registered for the race. This annual certified 5K Moms’ Run is Postpartum Support Charleston’s largest fundraiser, allowing the organization to further its mission of educating, supporting and healing women suffering from postpartum depression and anxiety. Postpartum Support Charleston offers support for women going through PPD and their families as well as community resources and education plus grants for women who may need financial assistance getting treatment for postpartum depression. “Unfortunately, many women feel too embarrassed and guilty to seek help and treatment for postpartum depression,” said Holly Fisher, PPD survivor and board president for Postpartum Support Charleston. “Having PPD does not mean women are bad mothers and they should know PPD is very treatable. There is no reason to suffer in silence. Race registration is $25; $30 for stroller registration (includes child T-shirt); $15 for children 10 and under. Those who register by April 19 will receive a T-shirt, printed bib and race bag. Prices increase $5 on May 1. Discounts are available for groups of 20 or more; email momsrun@ppdsupport.org. Or support the cause as a non-runner/walker for $25. For more information and registration details, visit www.ppdsupport.org/moms-run. Sponsorship and exhibitor opportunities are available; email momsrun@ppdsupport.org or call 843-732-1713. A HUGE thank you to everyone who made the 2013 Moms' Run + Family Fun Day such a success. We raised more than $11,000 at this year's event and topped out at more than 400 registered participants. Be sure to check out the photos from the run on our Facebook page (thank you, Grace Beahm, for those terrific photos). The race results are posted online. We're already getting excited for the 2014 event! If you're interested in being on the planning committee, sponsoring the Moms' Run or participating as a vendor, please email us at contact@ppdsupport.org. We are loving our new medals for this year's Moms' Run 5K winners. The only way to get one is participate in the Moms' Run (well, and run fast).